I've wanted to build a female inquisitor for quite a while now. 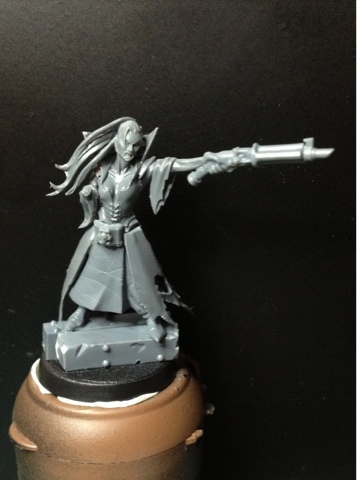 It´s a dark eldar head from the standard warrior kit, with the the top knot chopped off and the ears slightly un-pointyfied. I wanted to stay away from the dark eldar originally but it´s hard to find better looking plastic female heads... Apart from the vampires from the cover throne kit - but they are notoriously hard to come by. This is great. I bought the banshee and have been waiting to convert into a dark eldar. This is inspiration. Very cool! Looking forward to seeing how she comes together. Keep up the great work! looks like this one is going to be full of character, can't wait! Great movement to this one. Lovely start.